You can set the privilege levels of players by editing /settings/gobalprivileges.txt. This will effect all servers run on this machine. Additionally, you can edit /savegames/(save_game_name)/privileges to have a privileges list for that specific game mode. If a player has a higher privilege level in either file, they will be set to that level. When you log in to the Voxel Turf client, you will automatically be added as an admin on /settings/globalprivileges.txt. The effect is that you will always be an admin for servers run on your machine. In addition, you can whitelist your server. To do this, go to /settings/blacklist.txt, insert the line "%WHITELIST" in the file. This will make the server appear offline to any player that is not on the list. Keep in mind that you cannot run a server with both a blacklist and a whitelist at the same time. IRC style me command. Gives the output "*YourPlayerName Text"
Shuts down the server without saving. Gives you 10,000 credits. Gives Quantity if specified. Quantity may be negative. Gives you $10,000.00. Gives Quantity in dollars if specified. Quantity may be negative. Teleports you to (X, Y, Z). Does not care if (X, Y, Z) is out of bounds or not. If Y is not given then this teleports you to coordinate (X, YA, Z), where YA is the height of the heighest non-air block in the column at X, Z. Will then fail if (X, Z) are out of bounds. Pings the server and returns the round trip time. Executes the provided expression, client side. Prints the result to the in-game console. Fills the region (X1, Y1, Z1) to (X2, Y2, Z2) with block BLOCK_ID. This is a simple fill, any decals or electronics(!) present will still remain. Tip: Run the client with the --echoBlockPlacement switch to get block id and coordinates placed on screen whenever a block is placed. Replaces any instance of OLD_BLOCK_ID with NEW_BLOCK_ID in the region (X1, Y1, Z1) to (X2, Y2, Z2). This is a simple fill, any decals or electronics(!) present will still remain. Sets your notoriety/wanted level. VAL is a value from 0 to 5000. Sets and freezes the time of day as rendered by the client. /tfreeze TIME will set the time of day where 0.0 = midnight, 0.5 = midday and 1.0 = midnight, /tfreeze with no argument will unfreeze the time. /unfreeze also unfreezes the time. /dawn, /midday, /afternoon, /dusk and /middnight freezes the time at around these times (slightly off so that shadows actually render). The sever clock ticks along as usual. This does not count as a cheat and is executed clientside, so if you can't see at night or you want to film or take screenshots under a certain lighting conditions use these. If this lot is attached to another, then this lot is detached from it. Loads the lot from file /lots/FILENAME.lot into the map. DIR specifies the facing of the lot and must be n, s, e or w. If this is different than the saved direction, the lot will be rotated. In the case of a lot that is more than 1x1 in size, then lots to the east and north will be merged to fit the imported lot. 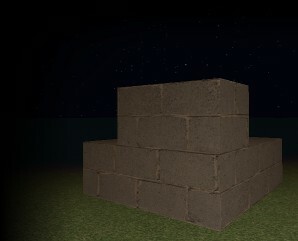 HEIGHT specifies the height at which the lot is imported, by default this is 1 block below the player. Finally FILLMODE determines what happens to blocks below and above the imported lot. If omitted, this will fill blocks below the lot with either stone or clay, depending on depth. Blocks above will be removed, and any decals or electronics above or below the lot will be removed. If NOFILL is passed, then blocks below and above are not touched. if BRIDGE is passed, then blocks below and above are not touched, however any non-air block from the bottom row of the lot will be filled downwards and penetrate 2m into the ground below. Marks the lot as a Road lot. This will appear white on the map. DIRFLAGS can be any combination of n, s, e, w, nh, sh, eh, wh and tl. For example "/lot road n s" will mark the lot as a road that the AI can drive north and south on. The "h" varients mark the lot as being high (like the platform of a bridge). tl will mark the lot as having traffic lights.